Learn the Parashah from one of the most beloved authors of our time, Rabbi Abraham J. Twerski. 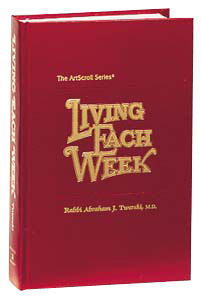 In Living Each Week, best-selling author, international lecturer, and noted rabbi and doctor, Rabbi Abraham J. Twerski present a follow up to his classic, Living Each Day. Filled with beautiful ideas, piercing insights, and provocative anecdotes – based on lessons from each weekly Torah reading – Living Each Week will enhance the lives of its readers and transform their understanding of the Parashah. Click here to view, print or download the chapter on Parashas Emor from Living Each Week. Enjoyed this post? Spread the word! Post or forward it to your family and friends. Click here for book details and exclusive online savings.